Web-based payroll outsourcing and human capital management for hardworking businesses. 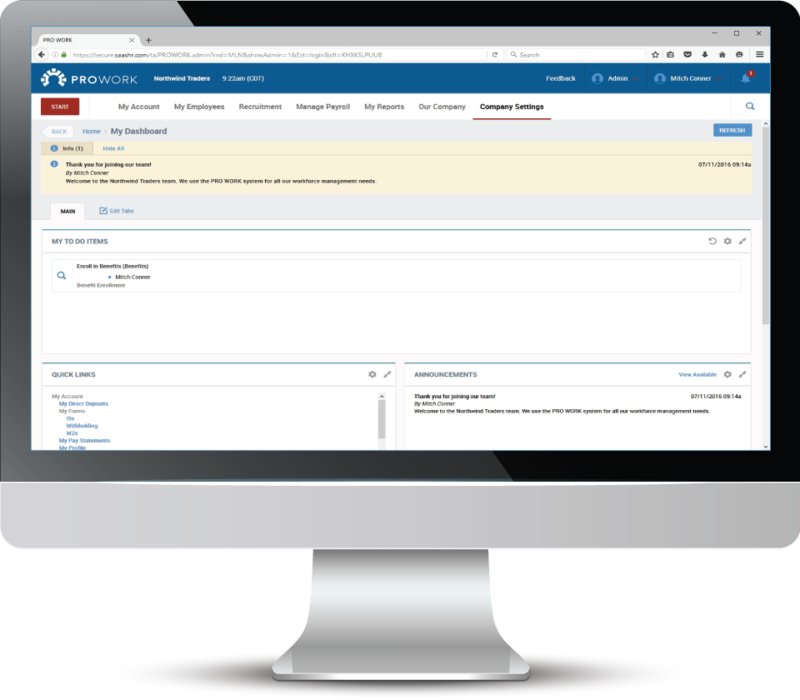 Streamline the application process by specifying the applicant information you need to collect. You’ll have the crucial information you need to make decisions, while making the application process much quicker and easier for everyone involved. Willing to relocate? What travel cost is needed? Willing to travel/percentage of travel? Allow applicants to search and apply for job openings within your company website. Give job-seekers a clear view of your job posting locations with this intuitive map, which can be embedded directly within your company website. Potential candidates can apply quickly and easily using their LinkedIn account. 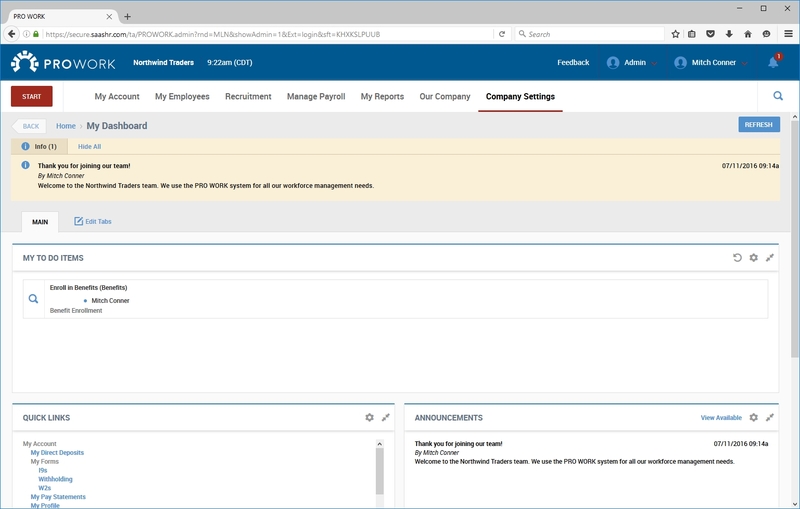 Contact information and previous work experience from a LinkedIn profile automatically populates within PROWORK. Create unlimited custom job postings for each career site your company wishes to use, allowing you track exactly where your applicants are coming from. Easily communicate with applicants to set up phone interviews, in-person interviews, or send a job offer via email right through PROWORK. Use consistent messaging with custom email templates that can pre-populate applicant information before sending. You can also use the system to track notes among multiple HR staff during and after the interview process. Access most self-service functionality right from the available iOS and Android apps! A multitude of export formats allows you the flexibility to look at your information any way you would like. These export options are available for each and every report within PROWORK. The dashboard is the first page you see when logging into PROWORK. 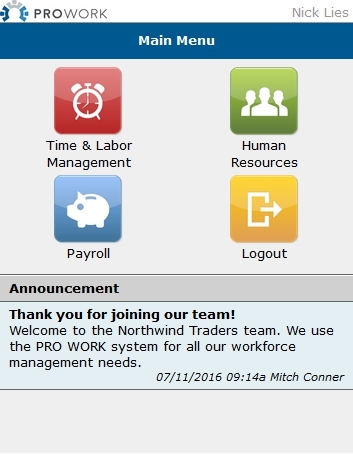 It provides quick access to different widgets including Quick Links for navigation, company announcements (HR module must be active) and much more. Adjust company settings, manage to-do lists and more in My Dashboard. Payroll outsourcing and workforce management for hardworking businesses.